I had heard that Chicago died its river green on St. Patrick's Day randomly a few years ago on Instagram but I had absolutely no idea it was such a huge occasion. Greg and I were originally just planning to walk down to the river at some point that Saturday to see the green river and take a few photos. However, the night before we were met one of his colleagues and his wife at a piano bar and they had found out that it was a big deal to be there when it actually happened. Someone told them that they officially died it around 9am but you had to be there by 8am to get a good spot. We googled it when we returned to our hotel later that night and found out that it was indeed a huge deal to watch the river turn green and that over 200,000 attended this event!! After a very long travel day and late night the night before, Greg and I were soooooo tired when our alarm went off at 7am but we got up and headed to our closest starbucks before heading down to the river for the river dying. We got to river right around 8am and went down to get as close to the water as we could. It was not very busy and we were soon doubting what we had heard about his event. 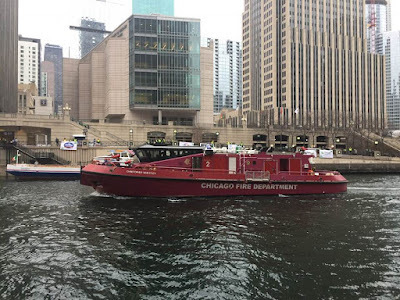 They had multiple police boats and this massive fire boat going up and down the river to keep an eye on things and to keep my entertained haha. 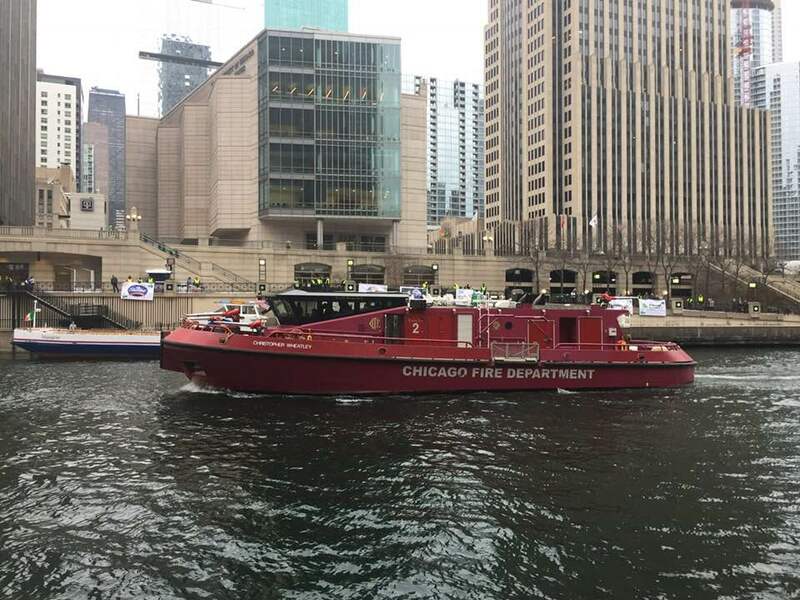 This fire boat was amazing and was a legit fire truck but in boat form. It was designed to fight fires on buildings directly from the water. I thought it was crazy at first but made sense once you remember that Chicago burnt down in 1871. 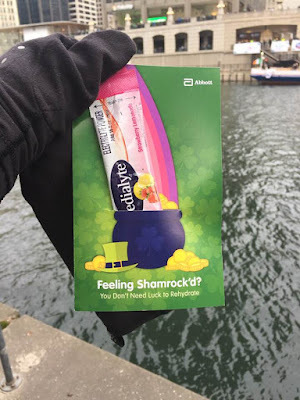 While we were waiting, we got free samples of pedialyte. The packaging made us both laugh. It was also very cold while we waited. Chicago is a very windy city whcih should have been a given since its official nickname is the windy city but I just never thought that it was as cold as it was. The problem is that on top of the wind, it is humid so it literally always felt cold. I honestly don't think i was warm the entire 6 days we were there. Being right by the water didn't help the warmth situation. The dying of the river is done every year on the Saturday before St. Patrick's Day (unless it actually falls on the Saturday) by the Local Plumbers Union. 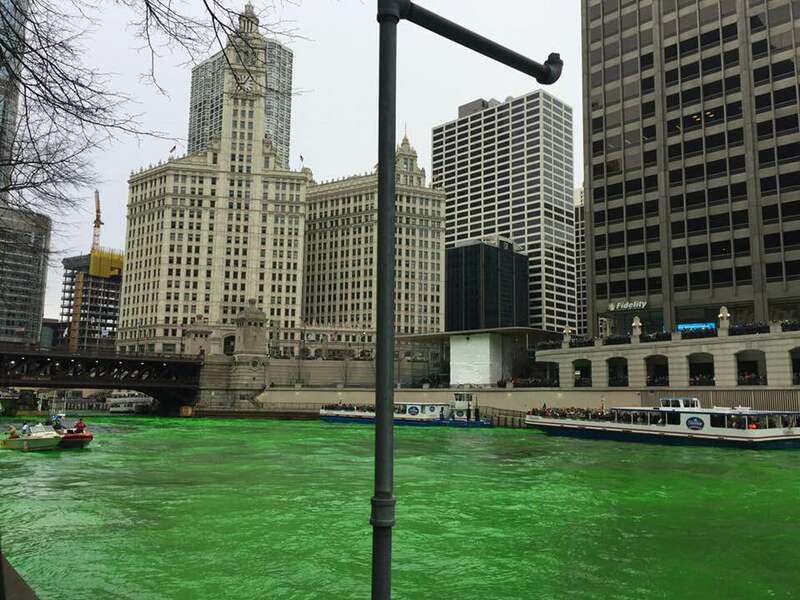 It started back in 1962 by then Chicago Mayor who wanted to dye Lake Michigan green for the holiday. 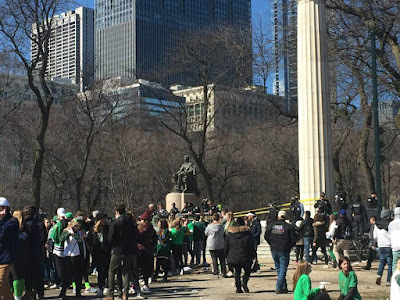 He is also credited with bringing back the St. Patrick's Day Parade to Chicago as well. 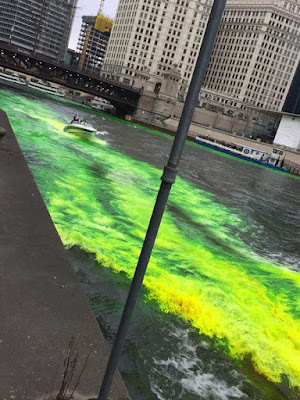 His friend who happened to be the Chicago Plumbers Union business manager suggested dyeing the Chicago River instead. 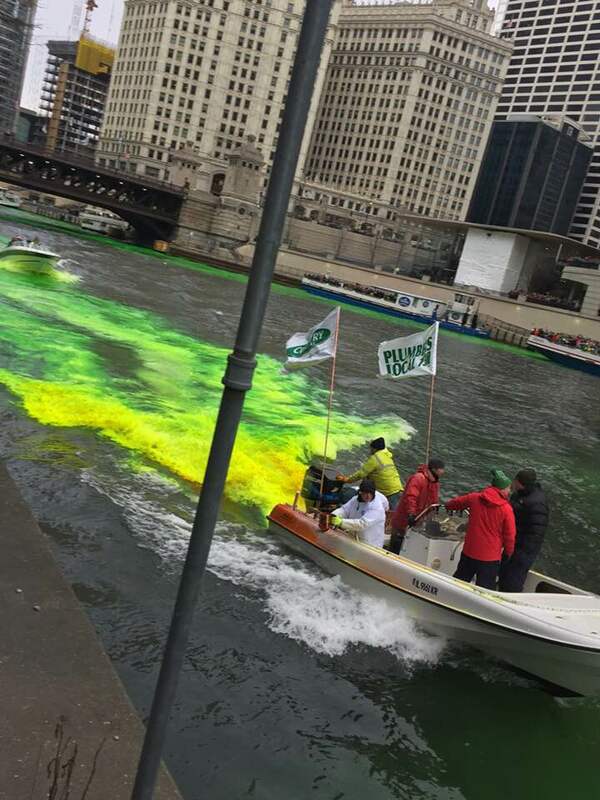 The river is dyed green with the help of 2 small boats (as seen above) donated by volunteers and a larger boat that is about 18 feet long. This boat uses flour sifters to dump about 40 lbs of an environmentally friendly orange powder into the river. The formula for the powder, which turns the water bright green when it hits, is top secret. All I could find online that it was a proprietary dye that the plumbers used to detect leaks in buildings but not sure how accurate that is or not. The other little boat comes behind and helps churn the water and that then helps disperse the powder throughout the river. 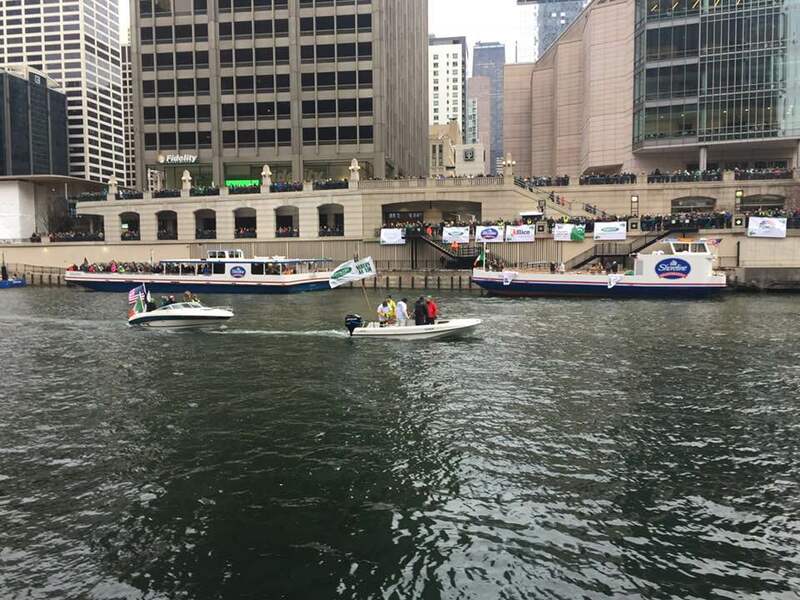 The largest boat is spraying out what I think is the same thing that the first boat was also releasing but I am not too sure. It was really cool watching this all happen. 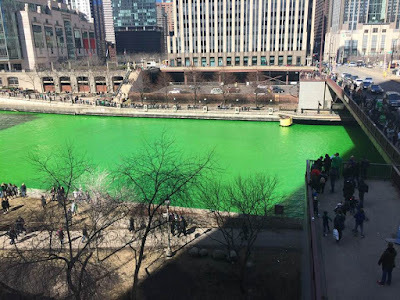 A photo of the Chicago River around 9:22am, apparently it takes about 45 minutes to see the full greenness of it, but we wer not waiting around for that. By this point, I had no feeling left in my hands or feet and was literally convulsing because of how cold I felt. But Greg and I both agreed that it was worth the lack of sleep and hypothermia to see this. By the time we left our area, there were about 5 rows of people behind us and it was crazy busy so they weren't wrong when they said that over 200,000 people came down for the river dying, It took forever to get up the stairs and back on the main roads and sidewalks. We were told more than 800.000 people come downtown for the St. Patrick's Day parade and they weren't exaggerating. It was crazy!! This was the crowd of people truing to get to one of the parade viewing spots. It was cold and we were still cold 3 hours later when the parade started so we skipped it and went to the Art Institute of Chicago instead. After we finished at the art institute, we realized that we were now in parade central and decided to head to Grant Park since I wanted to see the space where Barack Obama held both his victory speeches when he was elected President in 2008 + 2012. Apparently this was a herding space for food trucks, drunk people and alcohol. It was so crazy that I still have no real understanding of what it actually looks like haha. This was as close as we could get to the Lincoln statue and this was zoomed in. 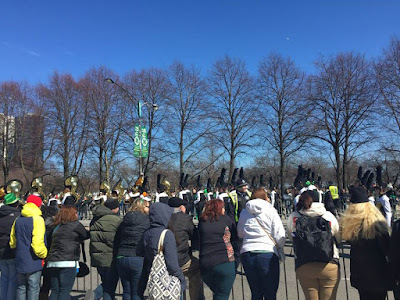 We continued to make our way towards Milennium Park from Grant Park and so part of the parade. They don't allow any chairs and you are barricaded from sitting on the street. The complete opposite of the Stampede Parade. Also, any streets that intersect with the parade route are blocked off with garbage trucks and trucks full of salt to prevent cars from driving into the crowds. And on these roads, they have swat vehicles with swat officers standing outside their vehicles with massive AK15's or whatever they called (forgive me for not knowing any gun). This was kinda scary to see. They also had locks on all the garbage cans forcing you to litter to prevent any bombings like what happened at the Boston Marathon in 2015. Such a crazy world we live in right now. 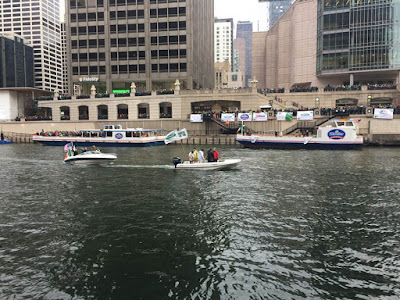 This was a shot of the Chicago River around 220 on our way to the Navy Pier. It was definitely a gorgeous shade of green when the sun hit it the right way. I honestly had no idea that St. Patrick's Day was such a huge deal in Chicago. To put it in perspective, it was like a week of the Calgary Stampede rolled into one day. 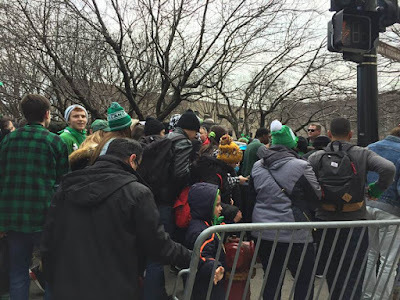 So many people, so much booze, pubs were opened at 9am and lined up around blocks by 930am. 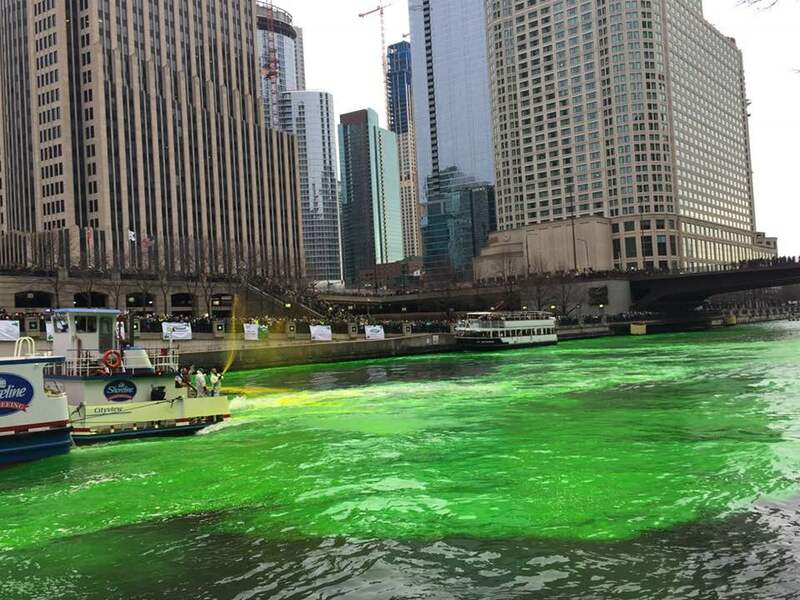 I am not sure I have seen so many people throw up downtown like that in my entire life. This all being said, I am so glad that Greg's company sent him here during this holiday weekend so that we could witness it first hand because it really was so cool. I don't know if I would ever come back during this weekend in the future but defiintely happy to experience it.